Check out MindBody for start dates and registration! Have you ever wanted to fly in the sky like circus performers? Now you can with our Aerial Hoop program. We have two beginner hoop classes for you to choose from. Our Beginner 1 Aerial Hoop Fundamentals class is for individuals who are new to fitness. 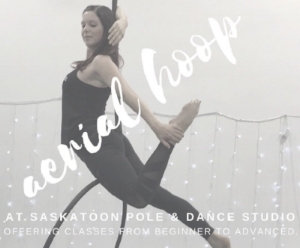 Our Beginner 2 Aerial Hoop Fundamentals class is for individuals who are new to aerial hoop but with a fitness background. Whatever your fitness level and class you choose to register in, you will learn the apparatus, mounts, and poses. Would you like to try pole dancing? Our Beginner 1 Fundamental class is for anyone who would like to try our pole. This class focuses on the foundation of pole including spins, transitions and flow. We have a variety of dance classes you can try from burlesque, chair dancing, contemporary, Twerk, Exotic Hip Hop and more! You can either register for a full session to hold your spot, or drop in anytime it works for your schedule. No experience required! For more information, check out our website, Facebook page, Instagram page or send us a message. Can't wait to dance, sweat, and fly in the sky with you soon!